Earlier this week I travelled to the little town of Hickman near Modesto to visit an almond farm. 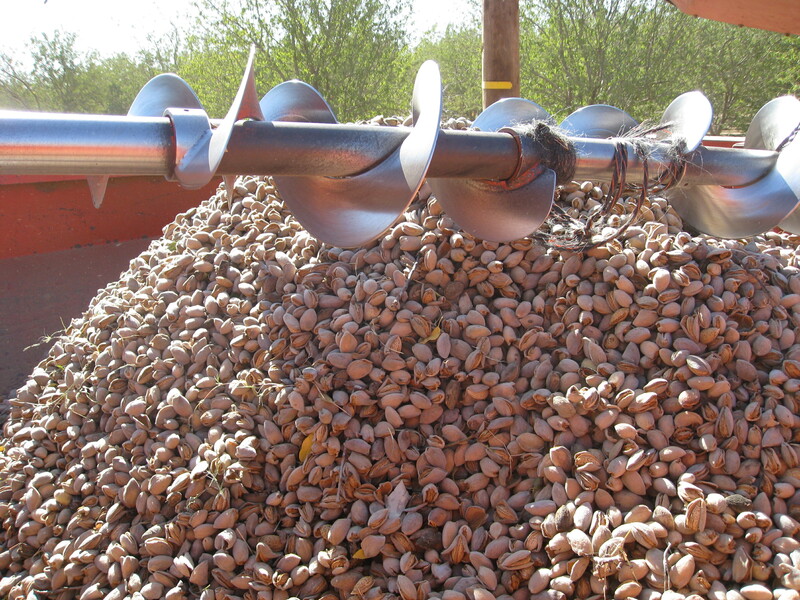 The almond harvest is winding down and I wanted to see the process at work. I always love driving through the Central Valley. 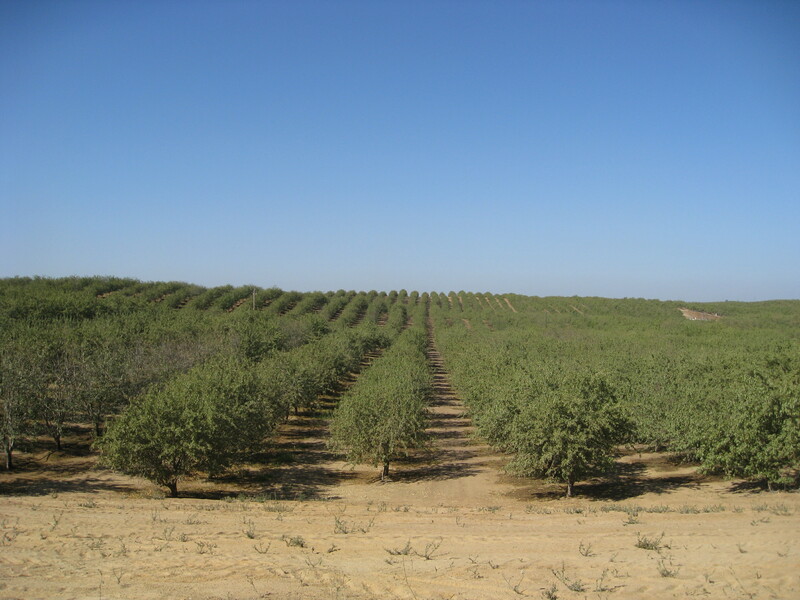 When you are in the middle of it surrounded by fields and groves of trees you fully appreciate the huge role agriculture plays in California both economically and as a food producer for the country and in many cases the world. The farm I visited was 3000 acres and had over 400,000 trees. Everywhere you looked all you could see was trees. As almonds are my favorite nut it was pretty awesome. For me, meeting the farmer, Casey, was like meeting a rock star. 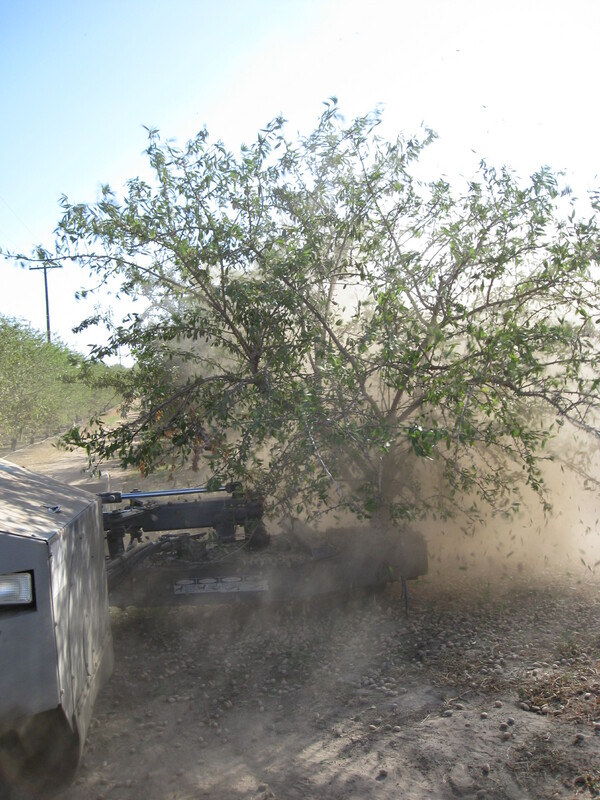 When the trees are ready to be harvested a machine called a shaker attaches to the trunk of the tree and shakes it. 5-10 seconds later all the almonds have fallen to the ground. Next a sweeper comes and with a couple of passes blows them all in a row so the picking machine can scoop them up. Then they are then put in trucks and taken about 5 miles down the road where they are hulled. Once hulled they are sorted, graded and finally sold. I always have freshly roasted whole natural almonds in my pantry. Natural almonds have the skin on. I buy them raw and roast them myself. I stock up on them when I go to the Valley as they are about $3.50 a pound! To bake them I spread them in a single layer on a cookie sheet and roast them in a preheated 350 degree convection oven for 15 minutes. You can check to see if they are done by cutting one in half. If light brown they’re ready. My husband has a handful for breakfast every morning. I like them as an afternoon snack with a little bittersweet chocolate. David, like many chefs fell into cooking half by accident, half planned. His Aunt Boo from Abbeville, LA gave him his first cast iron pan and taught him all the Creole basics- how to make a roux, etouffee and seafood gumbo. After two years of college he decided it wasn’t for him and thought he would try cooking. He attended a vocational savory cooking program in New Orleans and after graduation he set his sights on working at The Windsor Court Hotel. After numerous phone calls and interviews he had about given up hope and was about to take a job at a high volume lower quality place. Then magically the Windsor Court called and offered him a pastry cook position. He jumped at the chance, not caring what he was doing. He was in the door. David worked there for two years, first under German master pastry chef Kurt Ebert and then Lisa Ligget. 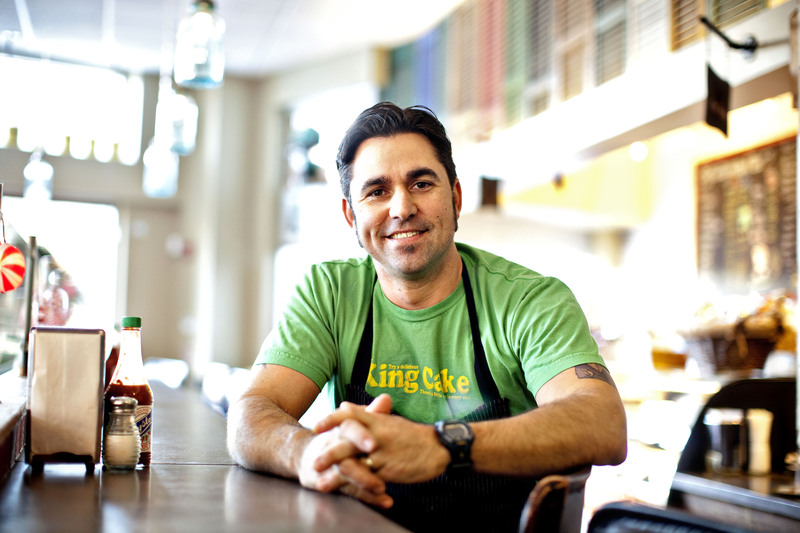 Jeff Tunks, chef on the culinary side, lured him to Washington to be the opening pastry chef at his restaurant DC Coast. David stayed with Jeff for 10 years eventually running 4 restaurants and managing a large crew. Coffee-Tiramisu when it’s done right. Also we grind coffee beans to very fine Turkish grind and add it with steeped Mexican cinnamon and sour cherries to brownies. Strawberries- I’m envious of California’s long strawberry season. Our season here is very short so I use them heavily when they are around. One of my favorites is our strawberry hand pies. We make our own jam and fill the pies with a cream cheese filling with the jam folded in. Almonds-We caramelize almonds, coat them in chocolate and toss them in a mixture of cocoa powder, sea salt and smoked paprika. 14. Where do you like to eat when you come to The Bay Area? On my last trip there I was checking out all the amazing coffee shops- Blue Bottle, Rituals and Fourbarrel. Last week I was lucky enough to attend the State Department reception in Washington, DC announcing The Diplomatic Culinary Partnership with The James Beard Foundation. Michael Bauer wrote about it in his blog on Tuesday. Hillary Rodham Clinton conceived the idea as one more way we can engage with other countries. This will happen on several levels- JBF will help The State Department identify chefs to cook for visiting dignitaries, be a resource for foreign chefs who come to The United States, and work with American chefs traveling abroad to meet with chefs in their respective countries. The initiative exists regardless of who is President. Its non partisan as food should be. About 40 chefs attended the event. 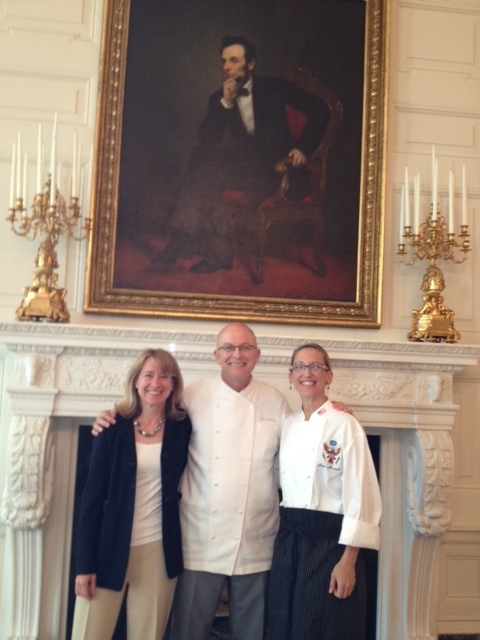 Before the reception the chefs got a tour of The White House. Chefs, a casual group for the most part, were all dressed up for the occasion. I haven’t ever seen that many chefs wearing ties. We all recognized how unique this experience was. The Green Room, which is now a sitting room, used to be Thomas Jefferson’s dining room. To stand in the room and envision him eating his meals there was humbling to say the least. We were all surprised by the size of the kitchen- it’s quite small- about the size of the upstairs kitchen at Waterbar. Seven people are on The White House culinary team. A small number considering the number and caliber of the people they serve. We walked down to see the infamous culinary garden full of late summertime produce and greenery. It was impressive to see the garden on one side of the lawn and an urban city with cars and pedestrians on the other. 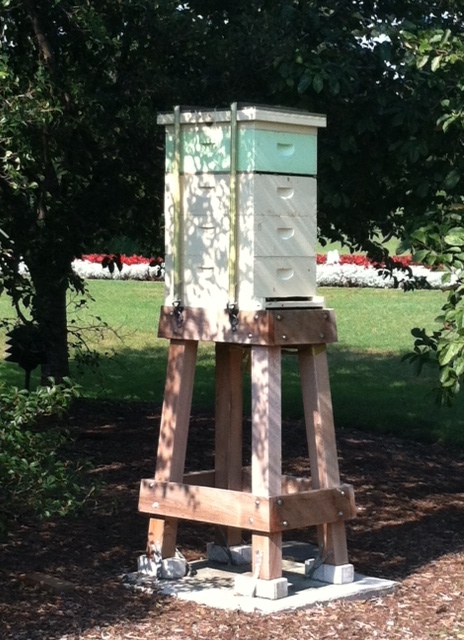 There’s been a lot of talk about White House beer but did you know they have a bee hive? It was inspiring to witness, and not just hear, that The White House looks at food the way we do. Hillary Clinton is right. Sharing food and cuisines can only heighten our relationships with others. We all know about 24 hour food television but do you know about 24 hour food radio? Heritage Radio is a superb online radio station with fascinating content. A 501(c)3 company it offers a wide range of hosted shows dealing with food culture, personalities, and tastemakers. Patrick Martins, founder of Slow Food USA and Heritage Foods created Heritage Radio. Chef’s Story, hosted by Dorothy Cann Hamilton, interviews chefs about their careers, food insights and influences. Taste Matters with Mitchell Davis looks at taste trends, memories and global food movements. Other shows explore culinary history, food politics, wine, southern food and traditions, cocktails and artisanal cheese. Shows can be heard live or go to their website (www.heritageradionetwork.com) and check the archives for past shows. You can also download shows from iTunes. I have a queue ready to go and listen when I am cooking at home or driving in the car. It’s relaxing and I always learn something and feel inspired. Originally from Minnesota, Jessica moved to Montana to go to college. While studying tree biology she paid the bills baking at various Mom and Pop style restaurants. After graduation she moved further west to Portland and found a job bartending but went in early to make bread. After several years working as a pastry chef at small restaurants in Portland she nixed her original plan to become a Life Flight Forest Ranger. She realized the kitchen was where she truly belonged. Jessica enrolled in the California Culinary Academy and moved to San Francisco. Lucky for us. Jessica is pastry chef at both Boulevard and Prospect. She splits her time between the two and is happy they are nearby. It makes for an easy commute between the two when issues come up. 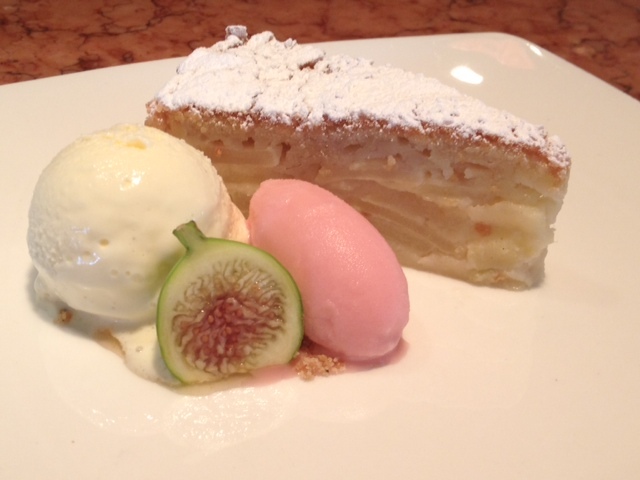 This week at Boulevard I spent some time chatting with Jessica about desserts. JS: Summer flavors at the market. I’m originally from Minnesota. When I first moved here I couldn’t believe all the produce. I still am impressed. All the different berries- Boysenberries, Tayberries, Black Raspberries. EL: What flavors/ingredients do you like least? EL: What dessert has someone else created that you loved? JS: Last week I ate at Rich Table. I had a delicious panna cotta with stone fruits and toasted almond crumble. It was perfect. 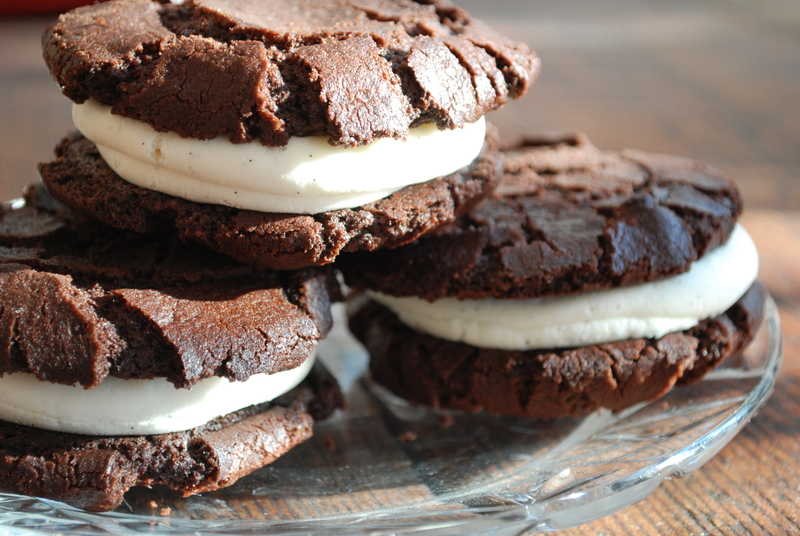 EL: Who has influenced your dessert style? JS: Rose Gray and Ruth Rogers from The River Café in London. Their style is rustic but perfect. I build off of it. Claudia Fleming, Emily Luchetti. 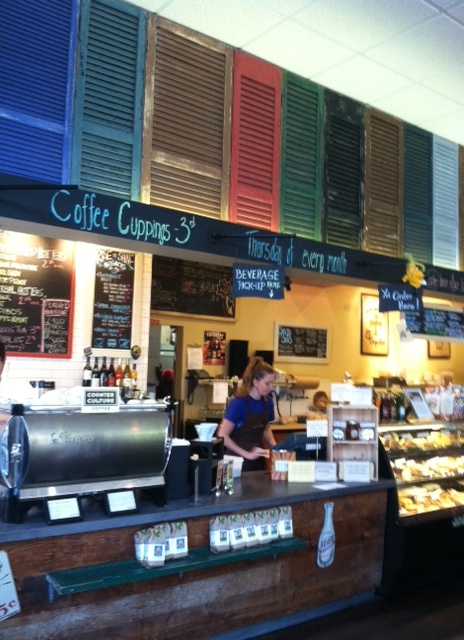 EL: What ingredient would you like to see used more in the pastry kitchen or appreciated by diners? JS: Cheeses in desserts. Figs. The figs are in the market now. They are so beautiful but they’re a hard sell. EL: What kitchen tool would you be lost without? JS: Julie- my right and left hand. EL: What’s your least favorite pastry trend? EL: Where do you like to eat out in the city? EL: What was the last thing you made outside of work? JS: Dinner- grilled Branzino and veggie succotash. EL: What’s a typical breakfast? Yogurt or a Vita Prep smoothie of green veggies. Sometimes just coffee. EL: What do people not know about you that you wish they did? I have a private pilot’s license. I am obsessed with cookbooks. I hear about a new one and have a one track mind until it’s on my kitchen counter or next to my bed. I have come to recognize a quick trip to Omnivore Books to pick up one book turns into an hour of browsing and leaving with an armful of titles. It’s worse since I can rationalize my purchases with the knowledge I can write them off on my income taxes. My fixation was one motivator when I decided to write my first book. I thought it would be cool to have my name in The Library of Congress. It was. I love books old and new. New ones with their innovative techniques and creative flavor combinations keep me current. Old ones show me where food has been and how it and even culture has evolved. You can imagine my delight then when I discovered, The Cookbook Library by Anne Willan. Published by University of California Press, it’s a cookbook about cookbooks. More specifically highlights from Willan’s and Mark Cherniavsky’s (her husband and co-author), vast vintage cookbook collection. The Cookbook Library is a historical overview of cookbooks from the 13th to 19th centuries. The authors translate selected recipes from their original form into English. Even the old English recipes need translating. As one recipe sates “…butter your hoop…”. Each recipe is then updated to current recipe standards so they can be prepared by today’s cook. Cookbooks were among the first books printed. Cookbooks in four languages (Latin, German, French and English) were printed before 1501. Early books were for the upper class and nobility as they had access and ability to pay for ingredients. Titles of books back then weren’t the quick catchy titles they are today. In 1552 Nostradamus published An Excellent and Most Useful Little Work Essential to All Who Wish to Become Acquainted with Some Exquisite Recipes. English cooks primarily wrote cookbooks for home cooks while The French wrote books for professionals. Not until the 19th Century did cookbooks focus on providing the number of servings in a recipe. At the time food many dishes were presented in a single course. Leftover food was served at another meal or given to servants. Blanc Mange, the dessert we know today consisting of milk, almonds and sugar originally was made with any white meat or fish and thickened with bread or flour. Weights have not always been standardized. They would fluctuate between regions and town. A little hard to send your recipe for chocolate chip cookies to your relatives two states over if they didn’t know the way you measured. Fast Days were not periods where you refrained from eating. They only eliminated meat. Other foods were still allowed. (As opposed to feast days which always had meat.) And we thought Meatless Mondays was a new concept. Whether you are a cookbook addict or someone who just wants to learn about the evolution of recipes, check out The Cookbook Library. You will find it a fascinating read.